Three years after Arakan State’s religiously motivated riots, its capital city has become segregated and intensely securitized. SITTWE, Arakan State — It has been more than three years since riots shook Arakan State, displacing 140,000, due to religiously motivated violence. Among those affected were members of the region’s ethnic Buddhist Arakanese majority and a disproportionate number of the Muslim Rohingya minority, who are denied citizenship and labeled as “Bengali” migrants by the Burmese government. 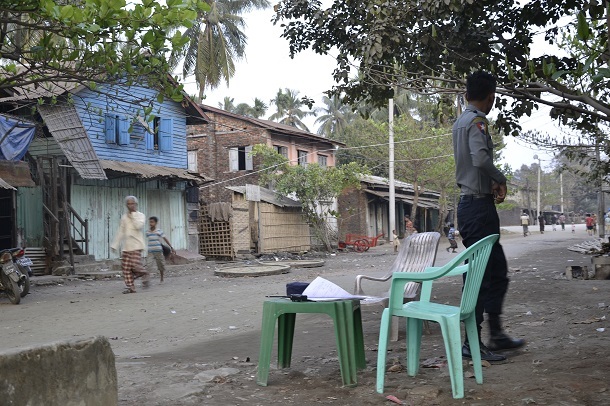 Pervasive mistrust, a consequence of the 2012 violence, persists in the Arakan State capital of Sittwe. On a recent visit, The Irrawaddy witnessed the presence of security guards throughout the city, and police checkpoints that have sprung up in the city’s Muslim quarter. There, vacant homes have been transformed into camps hosting security forces. Locals spoke quietly of living under surveillance, in conditions comparable to house arrest, and of the hope for steps toward the desecuritization of their city. The Irrawaddy visited Sittwe hoping to interview religious leaders. But authorities prohibit Arakanese visitors to Aung Mingalar, the Muslim quarter—also known by locals as Ambala—as well as Muslim visitors to the Arakanese Buddhist quarters. They say that these restrictions reportedly exist to prevent unexpected violations of the law. In order to enter the Muslim ward, an official permit is required. An armed security guard was stationed in front of the Ambala mosque when The Irrawaddy arrived. Mid-conversation with a small group of locals, a uniformed police officer arrived and questioned the presence of visitors. ‘‘We take [responsibility] for the security here and we can’t let strangers go inside. You need an official entitlement to visit this quarter,” he said. The clearance request for outsiders is not new to Zaw Zaw, a Rohingya Muslim man originally from Rangoon, but who relocated to Sittwe to run a small business. ‘‘If you want to enter this quarter, you need official permission from the Arakan State government,” he said, explaining that any interviews conducted had to be cleared by security officials. Zaw Zaw assumes that police encampments in Muslim quarters have been intentionally placed there for political purposes. Sittwe’s municipal market once hosted more than 150 shops owned by Aung Mingalar’s Muslim residents. Today they have all closed; restrictions banning Muslims from entering Buddhist Arakanese quarters also keep them from the city’s commercial area. Alhmet Ohsan, from Sittwe’s Bu May village, told The Irrawaddy that villagers were forbidden to shop or work downtown, so they bought commodities from Thae Chaung, once a village and now a camp for internally displaced Muslims. He owns a roadside stall and earns a maximum of 3,000 kyats (less than US$ 2.50) per day, an amount insufficient to feed the eight people in his family. Although his house is still standing, more than 40 homes in Bu May were burned down, leading many to seek refuge in IDP camps. The authorities have allowed some Arakanese to sell goods in the camps, but Muslim Rohingya are not allowed the same privilege, and are restricted from leaving. Those who evacuated received food and clothing from relief groups, Alhmet claims, but those who remained in the village have not had access to any aid. ‘‘Living in my own house feels better than being in a refugee camp,” he maintains. Although Alhmet does not regret staying in Bu May, others now feel trapped in their surroundings. “We feel like we are under house arrest,” said Mhamat Husein, an administrator for a Muslim neighborhood within Ambala. Zaw Zaw said his friendships with Buddhist Arakanese have also suffered in recent years. An influential monk, Badanta Dhamika, head of Thathana Ranthi monastery in Sittwe’s Bouk Thee Suu quarter, mediated between the Muslim and Buddhist communities during the violence of 2012. From his point of view, the situation is a “game” played by the Burmese government to exploit both sides; both will be victims, and opportunists will take advantage of their weaknesses, he explained. Badanta Dhamika told The Irrawadddy that the authorities use communal mistrust and tension as a justification to station security guards in the Muslim neighborhoods. His hope is that the authorities will gradually decrease the number of police in the area. Zaw Zaw agreed with Badanta Dhamika’s suggestion that changes should be introduced in small stages. Mistrust runs high; an integrated Sittwe where Buddhist Arakanese and Muslim Rohingya live together is still hard for many locals to imagine. Little government action has been taken to address the deep rifts in the city. Dr. Kyaw Yin Hlaing, an advisor to outgoing President Thein Sein, led a team formed in 2014 to assist in building peace in Arakan State. One aim of the initiative was reportedly to decrease tension between the region’s two religious communities. Both sides requested that a dialogue be arranged but, two years later, such talks have not been organized. The Irrawaddy contacted Kyaw Yin Hlaing by phone, but he could not be reached. Unsure of where to turn, members of the two communities said they are looking ahead to Burma’s incoming NLD-led government to address the legacy of violence still evident in the Arakan State capital.